Central Florida aspiring innkeepers wanted! Do You Have What It Takes To Become An Innkeeper? There is no substitute for real life experiences! With The B&B Team’s combined knowledge and experience in acquisition, valuation, financing options, staffing, innkeeping and hospitality you will be fully immersed in an intensely informative three day seminar. You will leave with an understanding of why so many innkeepers establish long term relationships with The B&B Team® from education to acquisition to retirement. We have been working with Aspiring Innkeepers since 1993 locally, regionally, and nationally and are pleased to offer innkeeping seminars for those who are seriously considering this wonderful profession. In 2010, The B&B Team is offering seminars for aspiring innkeepers from Florida to Maine. Spend an informative and fun weekend with us! Your inn seminar guides will be founding partner Peter Scherman and his wife, Peggy; partners and former innkeepers, Janet and Rick Wolf; and affiliates and former innkeepers, Scott and Marilyn Bushnell. On a lighter note, you will enjoy the conversation and camaraderie with different experienced and successful Innkeepers both evenings. January 22-24, 2010, held at the beautiful NightSwan Bed & Breakfast in New Smyrna Beach, Florida. 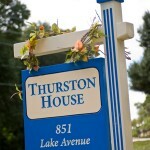 Make it a real vacation and book a night or two at Thurston House bed & breakfast, before or after the seminar. Book your room now!